Each year, World Ocean’s Day is celebrated on 8 June, highlighting the major role that oceans play in providing food, income, and enjoyment for millions of people. This year’s action focus draws global attention on encouraging solutions for a healthy ocean, an effort that CGIAR and our funding partners are actively supporting. Our oceans capture excess heat and carbon causing global warming, helping to regulate the earth’s temperature. Our oceans also supply half the world’s oxygen, and are home to millions of marine species which provide food and a livelihood to a billion people. However, our oceans are under intense pressure to keep up these vital functions. Marine wildlife is estimated to have halved in the last 45 years, and our oceans are around 30 per cent more acidic than before the industrial revolution. Unsustainable fisheries and damage of marine habitats are two of the main drivers of poor ocean health in the Pacific region. 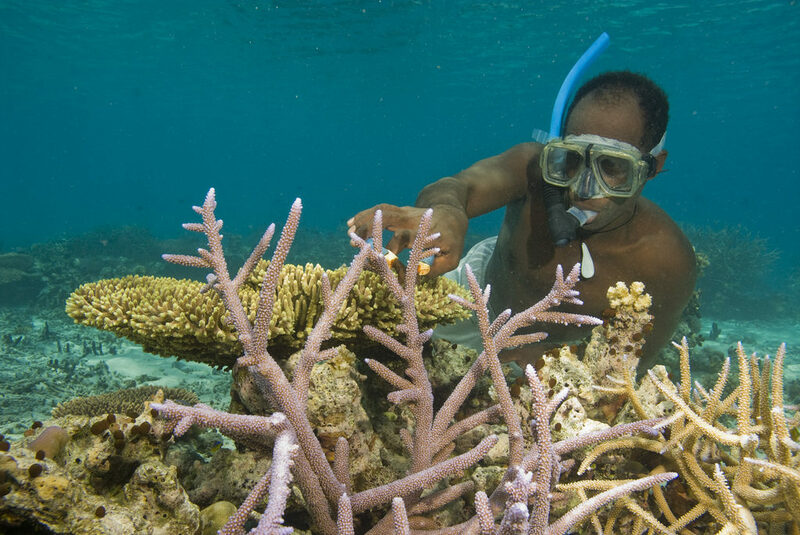 WorldFish, a CGIAR Research Center, and the Australian Centre for International Agricultural Research (ACIAR) have been working to assist Pacific fishers to sustainably manage their coastal fisheries and protect their reef habitat. A Fish Aggregating Device (FAD) in Langalanga Lagoon, Solomon Islands. Photo by Wade Fairley for WorldFish. Fishing and the development of aquaculture are critical for the food security and livelihoods of small island nations – less fishing is not the answer, we need safer and more sustainable fishing. Fishermen in Timor-Leste and the Solomon Islands are now reaping the rewards of FADs – “Fish aggregating devices” which are small man-made structures that float near the coast and attract oceanic fish such as tuna and mackerel. Fishers are able to capture more fish than ever before, without disturbing their delicate natural habitats – the fish now come to them. Coral reefs protect coastline communities from tropical storms, as well as being a vital source of nutrients for marine wildlife. Australian scientists have discovered that a process akin to IVF for humans can work for coral, encouraging their reproduction in laboratories. The larvae can then be placed back into the ocean to stimulate restoration of damaged reefs. The Pacific region is also rich in vegetative coastal habitats, such as mangroves and tidal marshes, which are thought to have up to 50 times the power of other ecosystems for capturing carbon. Indonesia alone has three million hectares of mangrove forests lining its 95,000-kilometer coastline. Efforts are now underway to replant 60,000 hectares of degraded mangroves each year in Indonesia, involving up to 200,000 farmers. Mellissa Wood, General Manager of Global Programs for the Australian Centre for International Agricultural Research (ACIAR) and Elwyn Grainger-Jones, Executive Director of the CGIAR System Organization, have co-authored a story published today by ABC News Australia. We hope that this World Ocean’s Day is a reminder of the importance of a healthy ocean and the need to ensure that Australia’s and CGIAR’s world-class research in this area gets the support it deserves. CGIAR has a wealth of experience and knowledge spanning 50 years that builds on a track-record of innovation and world class research.